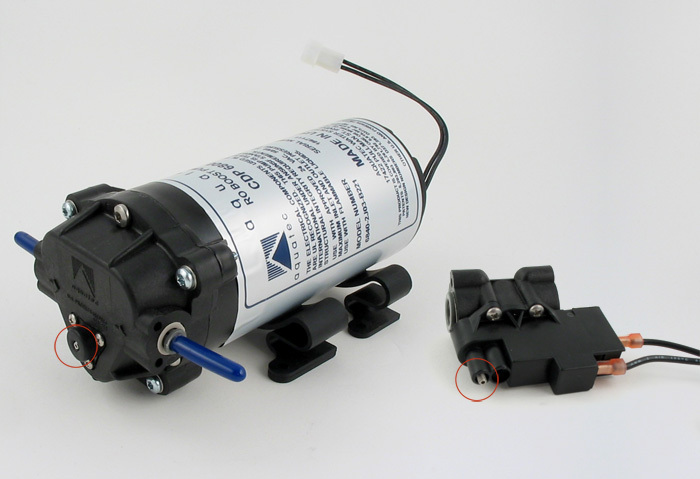 Both Aquatec pumps and tank pressure switches have pressure adjustments. The adjustment screws are indicated by the red circles in the picture. The adjustment is done with a very small Allen wrench — 050" to be exact. The factory preset is normally 80 psi for the pump and 40 psi for the pressure switch. These settings will run home RO units perfectly and allow a smooth shutoff of the pump when a good, strong tank pressure is reached. There is great wisdom in leaving the settings alone. Altering the setting on one component often makes altering the setting of the other necessary. The factory settings are best for most standard RO operation.